Valentine's Day is just a month away! Even if you weren't born in January, you may want to add garnet jewelry to your wishlist. The deep red January birthstone is a symbol of loyalty and affection when given as a gift. The gem can even evoke passion and sensual magic between lovers. However, if you're single and moping around about it - wearing garnet is also known to help overcome depression and protect against negative energy. Garnet has been one of my favorite gemstones since I bought a unique poison ring as a teenager - the tiny red jewel hid a container that I filled with a pinch of glitter. I couldn't find any rings like it on Etsy, but my eyes fell for these gorgeous garnet earrings instead. 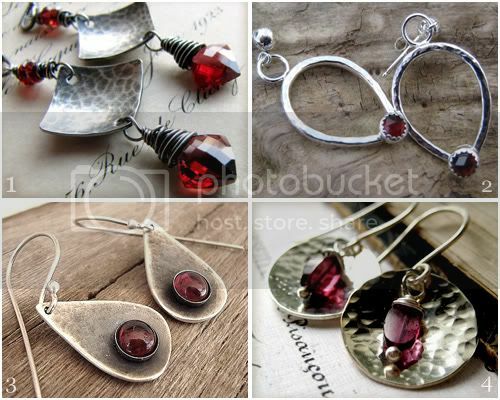 Each pair of gems is coupled with hammered sterling silver. Awesome garnet picks for January! It's not my birthstone, but it's still one of my favorite gemstones. Link up your Friday Feature on my blog! Challenevi's jewelry is the best!! I have several pieces now. Hey these are really an antique earrings which you have displayed on this blog. Like to see some more such fascinating earrings.